The new Ford Escape is a stylish, powerful, and popular midsize SUV. The Ford SUV makes the travels of passengers and drivers alike more pleasant with a wide variety of internal amenities. These amenities run the gamut from skylight sunroofs to heated seats and steering wheels. The new Escape SUV has plenty of glass in place for the viewing pleasure of drivers and passengers. 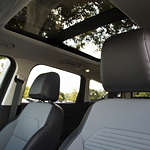 In addition to the well-appointed front and rear windows, the Escape also has a proprietary Vista Roof in its design. The Vista Roof has a panoramic design that can either fully retract or partially tilt up for less coverage. Plus, it also has a skylight in the rear that lets outside light inside the vehicle at all times. In addition to the window options, the Ford Escape also makes travel easier with comfortable and climate controlled seating arrangements. Drivers and passengers can enjoy heated or cooled front seats, and drivers get extra attention with the addition of heated steering wheels. For drivers who operate frequently in colder climates, the heated steering wheel can be a source of both comfort and added protection.